I’ve had a significant amount of fun with Arms, Nintendo’s latest game for the Nintendo Switch, but it’s a difficult title to recommend for a variety of reasons. I’ll preface this story by stating that I’m typically not a huge fan of fighting games, though I have spent a significant amount of time playing them over the years, particularly early entries in the Mortal Kombat series. 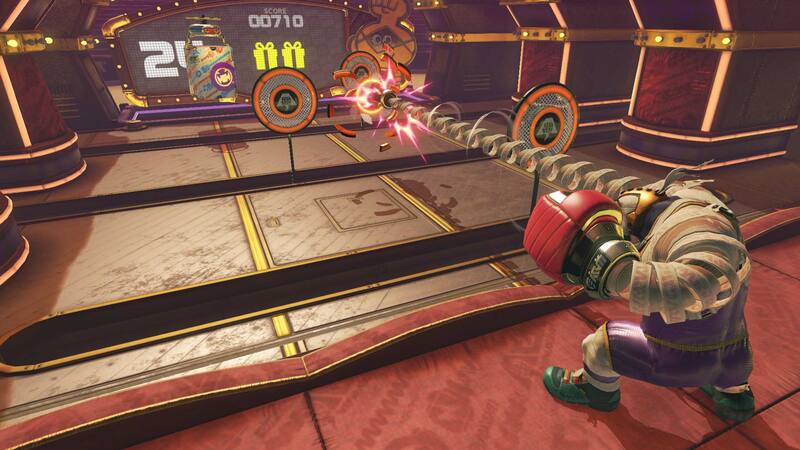 Arms, however, grabbed my attention, because the title’s colourful characters essentially have powerful, punching slinkies attached to their arms. It also turns out the game isn’t an expanded version of Wii Boxing like I initially assumed. Yes, Arms is still a traditional fighting game, but it’s definitely not what some have come to expect from the genre; this is probably also why I’ve had so much fun with it. Half Street Fighter (or any number of other fighting game titles), half Wii Boxing, Arms straddles the line between depth and accessibility expertly, though getting the hang of the game’s controls initially is a little intimidating if you want to be aware of exactly what moves your fighter is doing at all times. 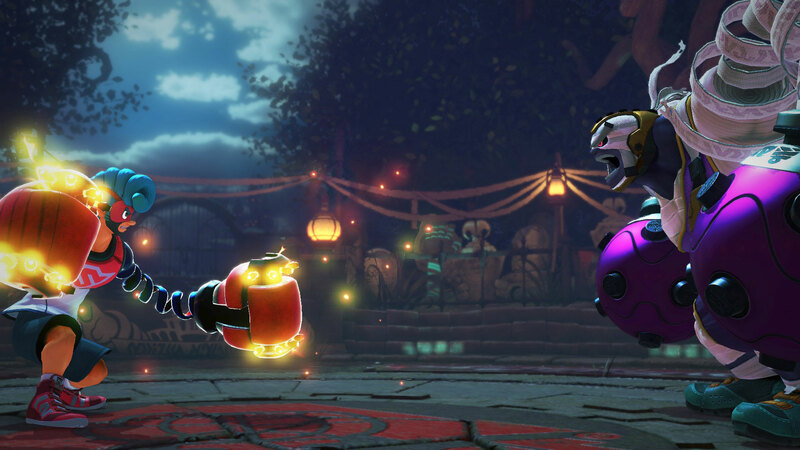 If you’re the type of player who is a button masher and doesn’t care about knowing what attacks they’re using, Arms fortunately — and unfortunately, depending on how you look at it — is playable this way as well, but only in local multiplayer. 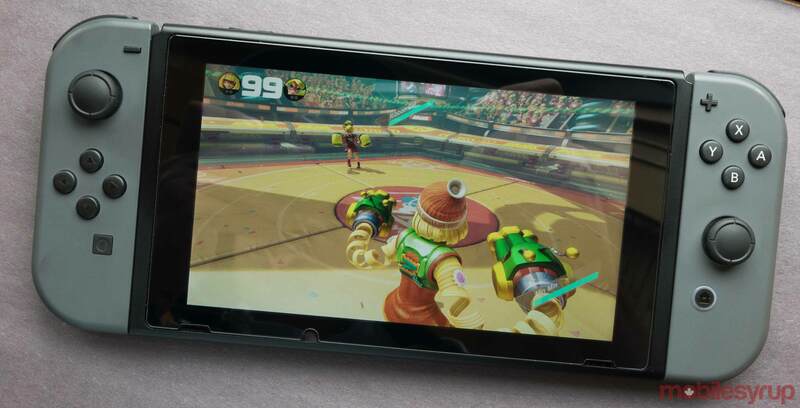 Jumping online and trying to mash away at the Switch’s Joy-cons in Arms will often result in a quick defeat. Make no mistake, when played skillfully, Arms is a surprisingly tactical game, with each punch, grab and jab possessing the ability to fundamentally change the momentum of a battle. This could frustrate those more experienced with fighting games, considering the game doesn’t feature complicated combos and other mechanics traditionally associated with the genre. For someone like myself though, I found this back-to-basics approach — especially since the game is played from a third-person shooter style, over-the-shoulder perspective — a refreshing and a welcome change of pace. Personally, getting up to speed with Arms’ punches, blocking and dodging, as well as ensuring my character was always frantically moving around at all times, took a few hours to get the hang of. It’s likely most people will feel the same way unless they’re very experienced with the fighting game genre. I also didn’t feel comfortable with the game’s motion controls, though I have heard some players prefer them. 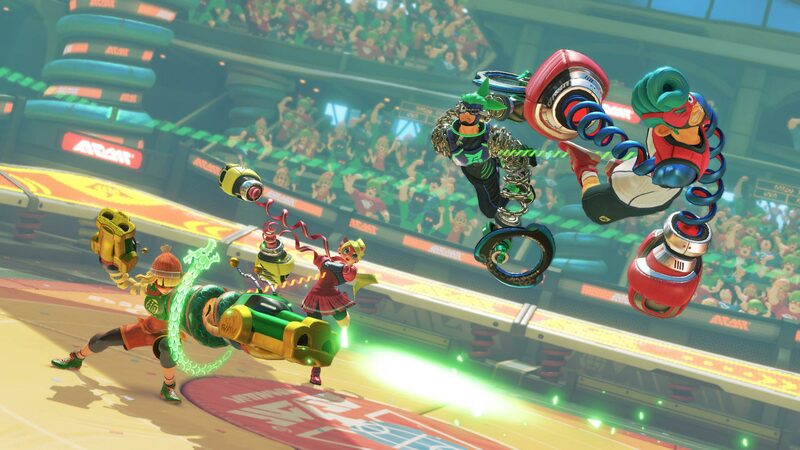 On one side of the spectrum, Arms is a great local multiplayer game, which makes sense given it was developed by the same team behind Mario Kart 8. Sitting down with a group of friends and engaging in one-on-one, or even team-based matches, is a blast. Each character also feels distinct. For example, Helix, my personal favourite combatant, slides around arenas with ease, moving his strange, green goo filled body like an awkward, hilariously looking ballerina. Ribbon Girl’s speed and jumping ability makes her a great long-range combatant, while Mechanica’s ability to glide through the air with a rocket pack, gives the hulking, heavy character a much-needed dose of maneuverability. Playing alone, however, is another story altogether. Arms’ singleplayer experience is barebones, with the game giving little backstory to any of its characters. While fighting games have never really been known for their narratives, Arms has interesting, unique characters that I want to learn more about. It’s a shame there’s not some sort of loose story built into the game that fleshes out its various combatants. 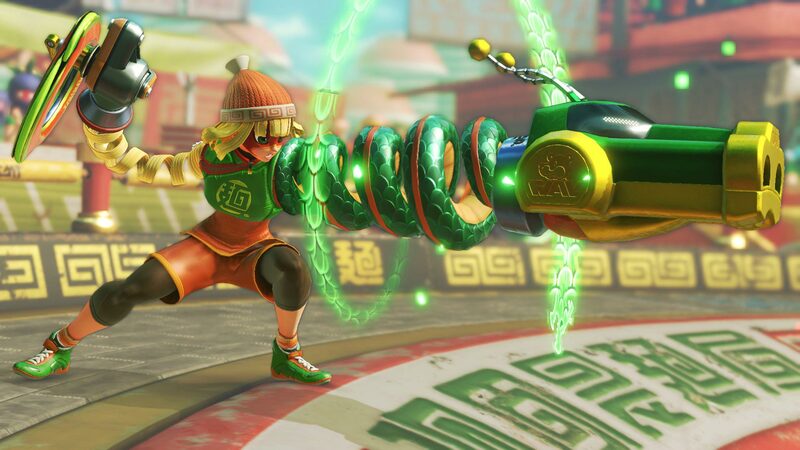 I really want to know why Min Min’s arms are made out of ramen noodles. There are also mini-games like volleyball, basketball and skillshot included in Arms, but none of these diversions held my attention for very long, leaving me instead to wade into the hyper-competitivewaters of of online Party Match and Ranked Match. While I’ve had some success in Party Match, Ranked Matches are brutally competitive and matchmaking doesn’t do a great job of matching equally skilled players together. For example, my first match was against a level six combatant and I didn’t land more than one or two hits. All in, Arms is a great game, but it depends on the type of experience you’re looking for. If you were hoping to find a deep singleplayer game to fill that post The Legend of Zelda: Breath of the Wild void, then Arms is not the game for you. Arms just doesn’t have much to offer in the singleplayer department and after completing its core campaign with a few characters, it quickly becomes boring. However, if you’re into fighting games and often engage in multiplayer battles with friends, then Arms is a solid title that’s definitely worth picking up.